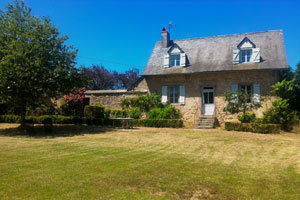 The gardener’s house is a lovely little burgundy house, situated within Ettevaux castle estate, in the quiet of nature. At the garden level, there is a living room with a TV and a wood-burner, a kitchen with dishwasher, a coffee machine, micro-wave, oven and toaster, with separate toilets, and a washing machine. On the 1st floor, there are 2 bedrooms (a double bed 160x200 in the first, 2 single beds 90x200 in the second) and one bathroom. There is a sofa bed in the living room for additional persons, and the possibility to add a baby bed. This cottage is perfect for a family stay, walking activites, mountain bike and other activities in nature.